It’s no secret that California is a vacation destination for millions, even for us who live here! Of the 268 million tourists that vacationed in California in 2017, about 75% of those were Californians (18% were Americans from other states, and 7% were international travelers). But even with that being the case, revenue is revenue, and so many overall people vacationing/touring in California has made it the number 1 tourism destination in the country. According to Visit California‘s president and chief executive, Caroline Beteta, our tourism industry is 2.5 times larger than Florida’s. L.A. County’s average hotel occupancy rate reached 81.3% last year, surpassing 80% for the first time in county history, with a record 29.2 million hotel room nights sold countywide, the tourism board said. “These remarkable achievements mark a sixth straight year of industry milestones, reaffirming tourism as a powerful driver of economic growth for Los Angeles,” said Ernest Wooden Jr., chief executive of the Los Angeles Tourism and Convention Board. Statewide hotel occupancy averaged 70 percent through February 2018, a 0.8 percent decrease year-to-date. Average daily rate was $159.96 per night, up 2.6 percent year-to-date. 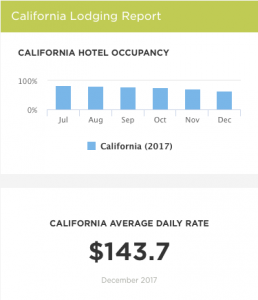 Revenue per available room (RevPAR) averaged $111.93, a 3.4 percent gain from 2017 year-to-date. Average U.S. occupancy increased 1.0 percent year-to-date. The bottom line is that the lodging industry is on a hot growth pattern right now which means there are more hotels & motels now that need insurance, and you’re the insurance agent that can get it for them through Abram. AND, by binding hotel/motel policies you may even win your own vacation! See details below. Hotel/Motel Risks May Qualify for our CL Incentive! Prizes include a 3-day Cruise, Hot Air Balloon Flight, & more! Amenities may include restaurants, pools, fitness centers, banquet halls, etc.